Being Guru Poornma today, this post begins with my humble pranams at the lotus feet of all the GURU’s who have taught me. For me GURU is the supreme energy who touches the mind of the illiterate and literally transforms the disciple into a scholar by removing the darkness. The Guru Gita (verse 17) aptly describes the guru as “dispeller of darkness” (from gu, “darkness” and ru, “that which dispels”). So the literal meaning of the word Guru is one who eliminates darkness or one who enlightens. “The guru is Brahma, Vishnu and Maheshwara (Siva), veneration to the Guru who is Parabrahman manifest.”Guru becomes Parabrahman – God, rather he is venerated as if God is manifesting through him. “Guru is Siva sans his three eyes, Vishnu sans his four arms Brahma sans his four heads. Just as an upasaka of Surya Deva(Sun) exudes the brilliance of sun, similarly a sishya radiates the glow and attraction of his guru. The prime GURU in our life is none other than our parents who teach us good values and morals from our early childhood , then comes our teachers who teach us various subjects. As we grow, we experience the fruits of 3 types of karmas. Prarabda karmas -Those karmas that have ripened from the huge sanchit pool that contributes towards our present experience-factors such as our life span, diseases, happiness,misery, family relations and friends etc are all pre-destined based on our karma. Kriyaman karmas – Those performed everyday in the present birth. When we are in the midst of prarabda karmas facing miseries that happens to us due to our past karmas, we may meet a GURU who opens the GATE FOR SPIRITUAL UPLIFTMENT. This is the most important time when we may come into contact with a Satpurush-an enlightened GURU. By his blessings and guidance, the person can cope with the pain and can cross the ocean of Samsara with a poised and well balanced mind. Perhaps..A GREAT GURU IS ON YOUR WAY TO SHOW YOU THE RIGHT PATH ! Thus we can identify these 3 Gurus in our life. Our Parents, Our Teachers who taught us in schools and then the GOD sent Spiritual GURU who will come in to our life with a helping hand to uplift us from the miseries of Samsara. The GURU played very important role in the life of musical Trinity Tyagaraja, Muthuswami Dikshithar and Syama Sastri. For Tyagaraja, when he chose Rama as his Ishta Devata, the additional advantage he had was Lord Anjaneya whom Tyagaraja considers as his Guru not only in Rama Bhakthi and Rama Seva but also in music. It is well-known in Sanskrit musical literature, that Anjaneya is an authority on music and himself a great vainika. When it comes to Muthuswami Dikshitar, as per his GURU’s instruction, he meditated Lord Subramania at Thiruttani Temple and it is said that Lord Subramanya appeared before him and placed a sugar candy in his tongue and from that time onwards Muthuswamy Dikshitar started composing krithis. His very first krithi being “Sree Nadadi Guruguho Jayathi Jayathi” in Mayamalavagoula Raga. The vaggeyakara mudra chosen by the great composer is Guruguha and it appears at the first line of the Pallavi itself. Thereafter in every composition of Dikshitar he thinks and thanks his GURU – Lord Subramanya by placing the mudra in the appropriate place. There is a legend from the Ramayana that states how one should respect a Guru. Lord Rama defeated Ravana and Ravana was in his deathbed breathing the last few breaths of his life. At that time Lakshmana felt happy that a cruel and bad person was defeated atlast. Then Lord Rama told Lakshmana, “Don’t underestimate or consider Ravana badly. He is a great person. A learned man, a great ruler and a great warrior. He knows what is just and what is unjust. The greatness of such a person went down just because he started wooing another man’s wife. Other than that there is no learned man as Ravana is” . Lakshmana got a bit surprised when his brother had a very good respect in his heart for Ravana. In fact, there are only two persons who are adorned with the sacred name Eashwaran (Lord Shiva). One is Saneeshwaran (Saturn, for his unbiased testing of human endurance and truth) and the other Elangeshwaran (King of Lanka – Ravana). So this itself shows how great should Ravana have been to attain such an adornment to his name. Lakshmana was shocked at this reply, he felt bad that he forgot the basic qualities of a good student. And Ravana’s reply really pricked his conscience. He went to Ravana’s feet and got the answer from him. Then he realised that what Lord Rama said was absolutely true. So this legend is an example of how a Guru should be given respect. But, nowadays…! Even, if we don’t follow such protocols, we can at least have it at heart. So we shall put a thought about it and remember our Gurus, the ladders of our life. 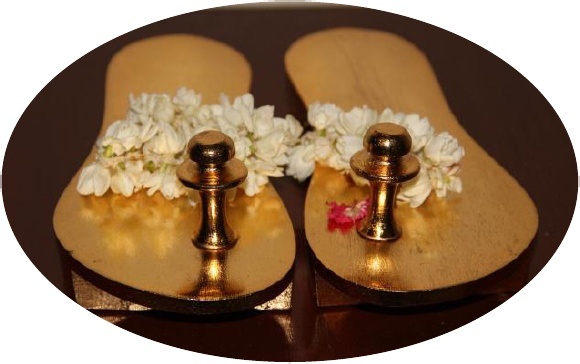 Concluding this post by once again offering pranams at the Lotus feet of my parents-my first GURUs and the various Gurus who have come to my life and blessed me with knowledge in academics, music and spiritual development..
Well written post Anu! Very thoughtful, meaningful and informative..